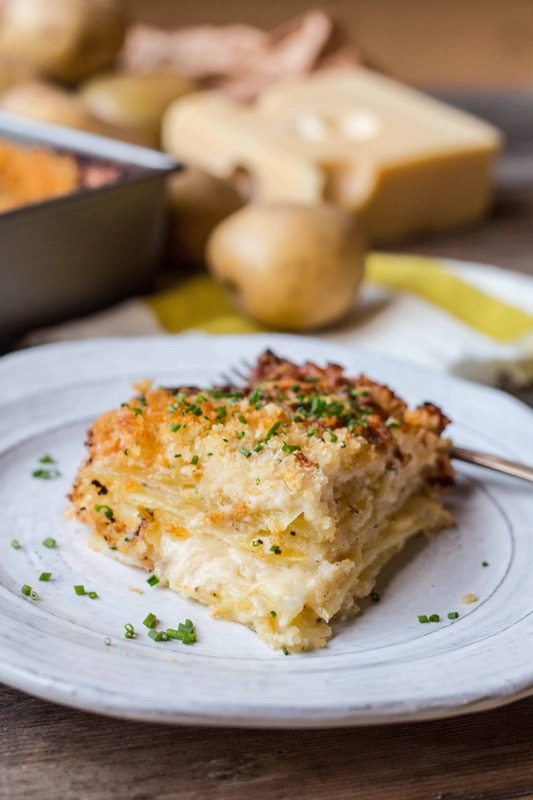 This classic recipe for potato gratin is simple to make but always has show-stopping results. Rich, creamy, crunchy – it will satisfy all your cravings. This post has been sponsored by Finlandia. All opinions are 100% my own. This is yet another one of my OG recipes that’s finally been given a permanent spot on the internet. I learned how to make this classic potato gratin in culinary school and it’s been a staple in my repertoire ever since. How can you go wrong with layers upon layers of thin, tender, creamy potatoes, oozy, nutty Swiss cheese and a golden, buttery, crunchy top? It’s the kind of side you want to save for those really special occasions. I don’t like to serve this dish on Thanksgiving because we already have mashed potatoes and sweet potatoes in the mix. Who needs that kind of competition? I find it works much better during the December holidays when it has the opportunity to really shine. This recipe pairs especially well with red meat (hello Christmas roast! ), which is exactly why just about every steakhouse in America has a version of it on their menu. Classically, a potato gratin is made with Gruyère cheese, which is aged and rather expensive. For this recipe, I swapped it out for Finlandia Swiss cheese and the results were even better than I’d imagined. In fact, I actually liked it better than the original. Finlandia Swiss is incredibly buttery and nutty tasting due to the high-quality, family-farmed milk that’s used to make it. It has a flavor that’s far more full and complex than any other Swiss cheese I’ve ever tasted, and is actually quite similar to Gruyère. But what really sets it apart is how well it melts. Gruyere can sometimes be a bit rubbery when melted, but Finlandia Swiss gets all ooey gooey and creamy, which is exactly what you want. Not just in a potato gratin, but in a grilled cheese, macaroni and cheese, fondue… really anywhere you want an exceptionally cheesy taste with perfect meltability. See all those little browned bits around the edge of the pan in the picture above? That is where the cheese meets with the heavy cream, bubbles up and mixes with the breadcrumbs to turn GBD (golden-brown-delicious) in the oven. This is what’s known in our house as the “crispy bits” or “nubbins,” and they are without question the best part. Be kind to your guests and don’t pick all of them off to eat by yourself before serving. That would be incredibly RUDE and I certainly wouldn’t know anything about it. I use thinly sliced Yukon Gold potatoes for this recipe. Why Yukon Golds? They’re a waxy potato – as opposed to a starchy potato like russets – which means they get extra creamy when cooked. I use my favorite mandolin slicer to make sure they’re sliced as thin and as even as possible. You can certainly use a knife, but it’s much more difficult to get every slice cut to the exact same thickness (and also takes a lot longer). Each layer of potatoes gets seasoned with a little bit of salt, pepper and a light sprinkle of grated Finlandia Swiss cheese to ensure lots of flavor is packed into each and every bite. Once the potatoes are all used up, we’ll drown the whole thing in heavy cream (yup) and give it a gentle grating of fresh nutmeg to enhance all the nutty, creamy notes. Let it be our little secret. 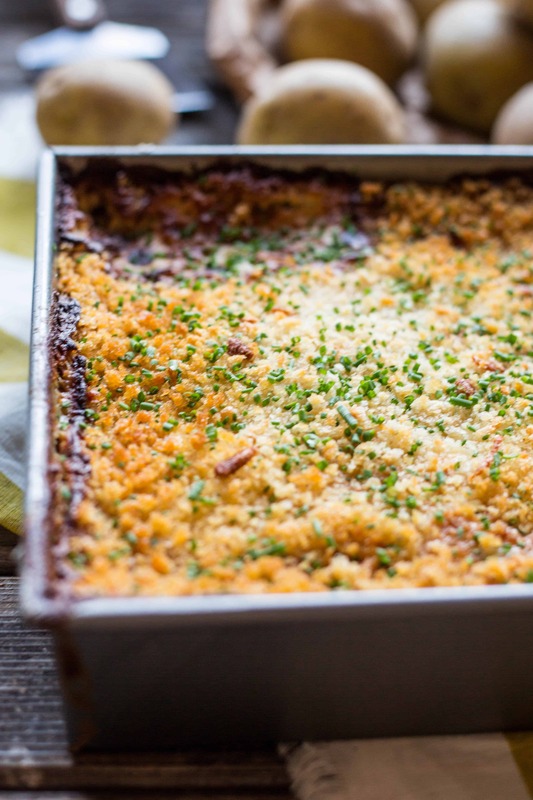 To finish things off, we’ll top it with a layer of crispy panko breadcrumbs, and as it bakes, they’ll absorb the fat from the cheese and cream to get beautifully golden brown, caramelized and crunchy. Baking time will depend on your oven and how thick the potatoes are sliced. One hour is a good benchmark, but it can take a bit more. Use a knife to pierce the middle of the gratin, and if you feel any resistance, let it bake just a little longer. You want those potatoes to be buttery soft, and if the top starts to brown a bit too much before they get there, just cover it up with some foil. You’ll definitely want to wait at least 10-20 minutes before cutting into this bad boy after baking, otherwise it will ooze out everywhere, not hold it’s shape and will most definitely burn your tongue. This classic recipe for potato gratin is simple to make but always has show-stopping results. Rich, creamy, crunchy – it will satisfy all your cravings. Preheat the oven to 350 degrees. Slice the potatoes as thin as possible, about 1/8 inch or less, using a mandolin slicer or a sharp knife. Rub the bottom and sides of an 8×8 (or similar sized) baking dish with softened butter, then place a single layer of potatoes on the bottom. Sprinkle lightly with salt and pepper, and then with scant layer of grated Finlandia Swiss or Gruyere cheese. Repeat with layers of potato, salt, pepper and cheese until you’ve used everything up. Pour heavy cream over the potatoes, then use your fingers to gently press out any air pockets. Freshly grate nutmeg* over top, then cover with panko breadcrumbs. Bake for about one hour (possibly longer), or until the top is golden brown and a knife can be easily inserted in the center, indicating that no raw pieces of potato remain. If the potatoes are still underdone and the top is getting too brown, cover with foil for the remainder of cooking time. Allow the gratin to cool down for at least 10 minutes before cutting. Garnish with chopped fresh chives if desired. *If using ground nutmeg rather than grating it fresh, first mix it in with the heavy cream for even distribution. 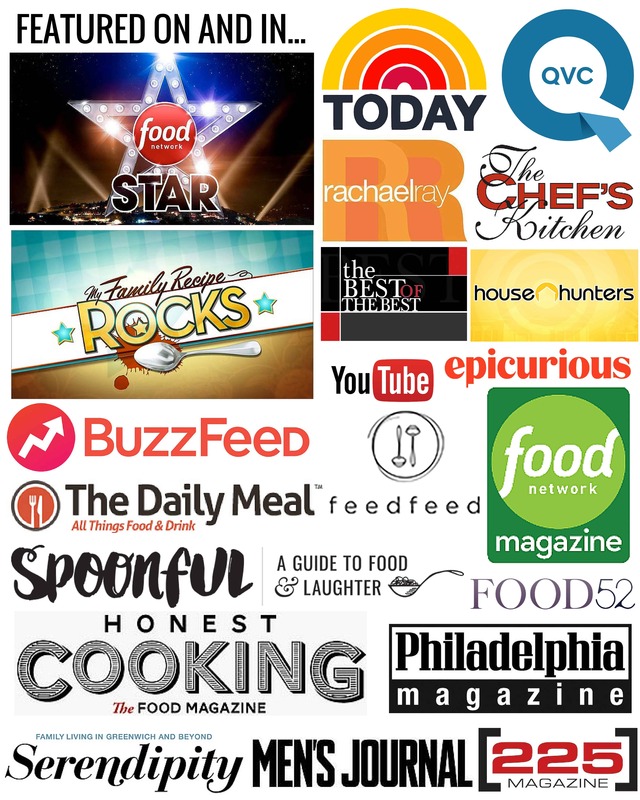 Subscribe to ‘Bon Appetit’ on YouTube to keep up with all of our latest videos and shows. The material on this site may not be reproduced, distributed, transmitted, cached or otherwise used, except with the prior written permission of Conde Nast.